TIAA CREF – Another BDS Hoax? We interrupt regular broadcasting with news of yet another potential BDS-related hoax. Once more, a hoax tale seems to be centered on TIAA-CREF. If you recall, the boycotters were caught red-handed several years ago trying to pass off a generic business decision by the retirement giant as a response to their request to get the organization to divest from Israel. Rather than simply act as though the whole incident never happened, the BDSers took the unusual step of launching a multi-year campaign to get TIAA-CREF to actually do what they had simply pretended they did the year before. The response to date from CREF has been a series of polite “please piss off” messages. Which is why this recent announcement that their divestment campaign has borne fruit seems mighty suspicious indeed. To begin with, the story is not accompanied by any statement from TIAA-CREF itself that it has taken any action that could be described as political in nature. Which makes sense once you realize that CREF is still heavily invested in the company the boycotters are claiming as a divestment win (the long suffering Caterpillar Corporation). In fact, if you dig a little deeper it looks like CREF did not make any politically related investment or divestment decision at all, but rather that one of its funds (one targeting social investors) was following the lead of an independent research firm (MSCI) which generates an index which many “Social Responsibility” investment funds use to determine what will and will not be included in their portfolios. Now earlier this year, MSCI downgraded and eventually removed Caterpillar from their index, which means that CREF was just following along with a decision made by an independent researcher, not making a judgment regarding Caterpillar on its own (as reflected by the fact that other funds managed by CREF still hold millions in Caterpillar stock). Which brings us to the question of why did MSCI (an organization none of us – including the BDSers – ever noticed or mentioned until just this week) made the decision they did regarding Caterpillar? Might MSCI have taken into account some of the faux controversy the BDSers themselves have generated in judging whether Caterpillar was in or out? Or might some of the union issues the company has been facing been a deciding factor? We don’t know (but many of us are trying to find out). But given the total lack of evidence those touting the “BDS victory” narrative have produced, I think it’s safe to say that we’re looking at another situation where a business decision with no specifically known motivation is being sold by the boycotters as a result of their work. And given the boycotter’s track record for fraudulently trying to pass off similar stories in the past, I think it’s safe to ignore any BDS bombast until they can produce for us a quote from TIAA-CREF itself (the company they are claiming to have done the BDSers’ bidding) confirming the story. I have a sneaking suspicion that this move may represent a “long bomb” play by the boycotters in the run-up to next week’s PCUSA General Assembly, a hope that one story of BDS success or momentum might help put them over the top when the Presbyterians vote on divestment in the next couple of weeks. But if this turns out to be yet another BDS hoax, one wonders how that story will play out as the boycotters descend on Pittsburg in order to explain to the Presbyterians that following them is the only moral choice. 22 Responses to TIAA CREF – Another BDS Hoax? There is no reason to put a question mark on the hoax statement. Of course the announcement is a hoax issued when the JVPers checked the latest TIAA-CREF website information. The BDS “victory announcements” to their foot soldiers completely omit the fact of the MSCI index shift (they know it has nothing to do with Israel). It is safe to assume that TIAA-CREF simply moved their Caterpillar shares into other funds which follow appropriate investment indexes containing Caterpillar stock. BDSers are now at a loss as to what to do with their signature TIAA-CREF boycott campaign – after all TIAA-CREF still owns millions of Caterpillar shares – same ones they always owned. BTW, weren't there other US companies targeted by the same TIAA-CREF divestment campaign? Since their MSCI index did not change, they are all still in that investment fund. So much for divestment claim. And yes, his hoax timing is being used to rally the troops for the Presbeterians meeting, after all the BDSers have nothing to show for their efforts this year. Interesting analysis. Thanks for this post. I posted an response to the Forward article on my blog this morning, before I read this comment. I hope that Forward either verifies or prints a retraction soon. MSCI is in fact a major player in the field of “Environmental, Social and Governance” Investing (ESG; which is the new term for the formerly more common “socially responsible”). However, one has to know that this category does or does not connote. As far as I can tell from what is being reported, the decision was basically meaningless in the context of the eternal divestment debate. All it presumably/at most means is that CAT does not meet the ESG standard. For that purpose, it would suffice to categorize its equipment as being intended for military use. 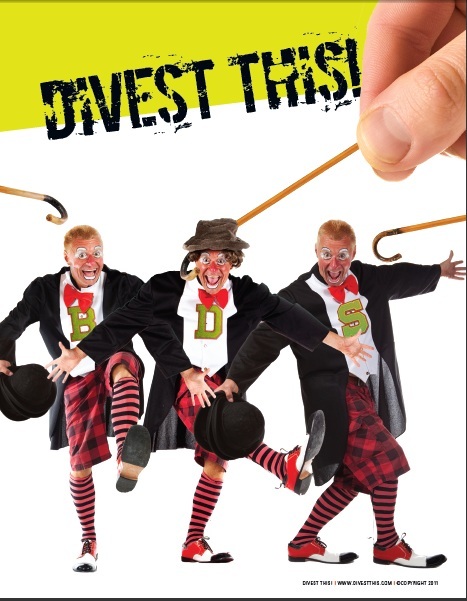 Absent the sort of explicit political statement that you correctly call for, that is not divestment. A company that (hypothetically) produced military equipment used only in internationally sanctioned interventions against genocide would be excluded from such a fund. So would a company that manufactured sporting firearms. For that matter, so are companies that derive major portions of their revenue from alcohol or tobacco. This all bears a striking parallel to the Hampshire College divestment hoax, with which you are all too familiar. In that case, the reallocation of some holdings indicated that they did not meet the socially responsible standard. To exclude a firm because of military equipment manufacture/sales makes no necessary judgment on the character of a country or its policies. But Caterpillar has continually denied the accusation that its equipment is intended for military use, continually reaffirming its position that it is the Israeli military, not Caterpillar, that outfits the bulldozers and other such equipment with military weaponry, and so Caterpillar is not directly culpable. At this time, I don't think anyone knows exactly why MSCI has chosen to remove Caterpillar from its index, but if they have chosen to do so because of Caterpillar's contracts with the Israeli government, it will be an even larger win for BDS than the aforementioned TIAA-CREF news. What is it with anti-Israel people? All they've got is hoaxes. There's the parade of BDS hoaxes like this one, and Hampshire. Then they are always pushing the Khazar hoax. And there is always a hubub about those faked and staged photographs from the PA and Reuters. I would say a pretty good metric of the overall legitimacy of a political movement is their commitment to facts and the truth. And on these counts the anti-Israel side is terrible. But if you read over the JVP press release on the subject (http://jewishvoiceforpeace.org/blog/bds-victory-tiaa-cref-dumps-cat-stock), the group is explicitly claiming not just that TIAA CREF has engaged in an act of political divestment, but that they took this act in defiance of an important NY Congressman. While I can imagine ways they may try to worm out of such a claim if it's revealed TIAA CREF did nothing of the kind, there's no getting around the fact that this is the second time the BDSers have been caught trying to stuff words into TIAA CREF's mouth that are demonstrably true. So the aforementioned TIAA-CREF news you mention is likely to be that TIAA-CREF has NOT divested from Israel (again), so no doubt any story coming out of MSCI will have to be better news for the boycotters than that. Unless, of course, it turns out that JVP et al were lying about MSCI as well. In which case this will be a very big BDS story indeed. The Forward pulled down their story which was based on the JVP press release. So you see, their reporting on Divestment is about as accurate as their reporting on Israel. No one takes Mondoweiss or the Electronic Intifada seriously. These are heavily biased and habitually unreliable sources. If you rely on them for information, Anonymouse, you'll never know the truth. Don't forget- JVP's original target was to get Tiaa cref to divest from 6 companies. Tiaa cref didn't actually divest from Caterpillar and still invests millions in the stock. If you miss 5 out of 6, is it still a “Huge victory”? Yes. And the fact that we're even talking about it right now is a huge victory for them, too. And if we weren't talking about it? Another huge victory. BDS Wins Again(tm)! The Jewish Federation of North America lies. I'll be posting something tomorrow that clears up some of the issues that have been floating around regarding MSCI. While I'm pulling that together, any chance you can give us an unambiguous statement from one or more key decision makers at TIAA-CREF in which they clearly explain that their decision was motivated by Middle East political issues? After all, the BDSers are still claiming a TIAA-CREF (not an MSCI) victory, so I think it would be a simple matter for you to provide us support for your view by the very organization you claim is now in the divestment camp. Oh, and while you're at it, can you provide some background on the conversations that took place within TIAA-CREF during which (as Jewish Voice for Peace asserts over five paragraphs in this press release – http://www.divestthis.com/2012/06/tiaa-cref-bds-hoax-motivation.html) TIAA-CREF officials made the decision to not just divest from Israel but to do so in defiance of a US Congressman? It seems strange that Jewish Voice for Peace would be privy to such internal CREF conversations, but no doubt you can help us clear up what would otherwise seem like an example of the BDS movement making stuff up as it goes along. I also wrote on the subject!